Today I’m really excited to bring you this product review for Studio Gear’s Holiday Smokey Eye Palette. let’s dive right in! Founded by industry veterans Steve Rohr and John Avolio, Studio Gear Cosmetics is a prestigous cosmetics brand featuring a full collection of professional makeup brushes, revolutionalizing complexion formulas, and a wide selection of color products for the eyes, cheeks, and lips. Since 1996, Studio Gear has been on set at hundreds of professional photo shoots, in the beauty departments of Bloomingdales, Macy’s, Dillard’s, HSN and ULTA, and also in the everyday woman’s makeup bag. This is a line created true to the concept that every woman deserves professional, high quality cosmetics at a reasonable price. Includes white, silver, gold, and coal eye shadows and a perfect pink blush. This palette is available on our website and at select ULTA BEAUTY locations (starting in December). The packaging is really nice – very compact and visually appealing. (Another reason this palette would make a great gift for someone. 😉 The palette has a strong magnetic close to it, so once you let it fall closed you don’t have to worry about it accidentally opening. The step-by-step instructions that they include inside is really handy, especially if you are a beginner with eyeshadow or you are gifting this palette to someone who is a beginner. The selection of colors for this palette was very “holiday appropriate” with the gold, silver and sparkles. I could totally see someone using this palette to make a beautiful, sparkling smokey eye for a Christmas Eve event. The blush was totally matte, but it did have some very tiny, subtle shimmer in it. As I said above, very appropriate for this holiday season. 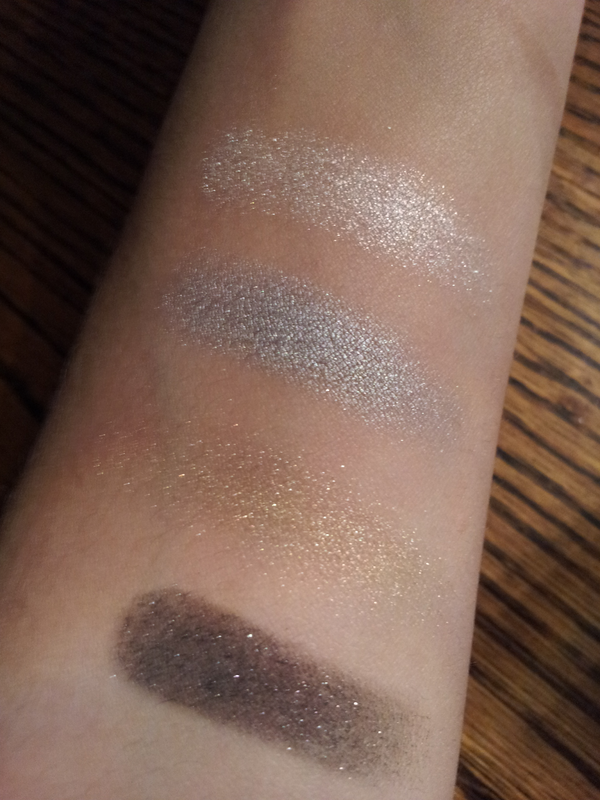 Okay, so I first swatched these colors on my arm without eye primer and wasn’t too impressed, honestly. The colors did show up, but not very pigmented at all. And the glitter shadows (Frost and Glimmer) showed up more as just glitter than eye shadow. However, with that said, I did go back and swatch these on top of a primer (picture below) and was very pleased with how well the colors showed up that time. The glitter shadows had a lot more color in them. They show up really well when applied with a brush on the eyes, but I prefer using my fingers to apply it as I feel I get a more pigmented, richer application. The colors lasted very well on my eyelids. Let me say, though, that I tend to have very oily eyelids and any eyeshadow that I put on without a primer will crease, no matter what. But with a primer, these shadows lasted as long as I’d expect them to and about how long my other eyeshadows last (that are from LORAC, Wet n Wild, Physicians Formula). Out of all the eye colors in this palette, I found that I really liked Platinum the best. It was a beautiful silver that matched a lot of my outfits. And when I used that along with the Coal shade, I was able to get a great smokey eye. I personally prefer the darker eye looks, so this palette is right up my alley. As for the blush, I’ll be honest and say that I initially thought I wouldn’t like it — it had a glittery/shimmer finish and since I have pretty oily skin, I usually stay away from shimmer as it makes my oiliness look worse. I use a very light hand when I apply this, but I was really surprised and pleased with the results. It gave my cheeks a very nice, natural glow to them. And since this palette is meant for the holidays and to use with a smokey eye, I can imagine having a blush with some shimmer would be really good for an evening event — to help keep the glow in your face, even in dim lighting. 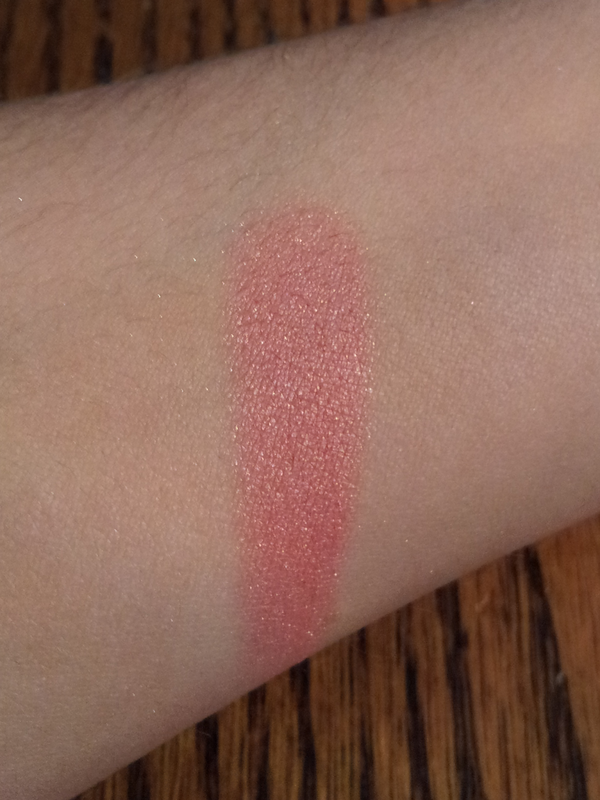 Swatch of the blush. Very pretty! No primer of any kind. I stated this before, but I’ll mention it again — I’m not a fan of glitter. I enjoy some shimmer in my eyeshadows on occasion, but don’t like the chunky-looking glitter that I see in some shadows. So, as you may guess, I wasn’t as big a fan of the Frost and Glimmer shadows as someone who liked glitter might be. I noticed that out of all the shadows, the glittery shades would start to loose the pigmentation first, leaving the lids with just a glittery mess. This is not something I enjoy – at all – and so I find that I tend to leave these two colors alone, for the most part. That’s really all that I have to say for dislikes. The colors weren’t super vivid/pigmented, but with a primer I was very pleased with the color payoff. All in all, the Holiday Smokey Eye Palette is a very nice palette to give to someone this season. And with the special introductory price of $25, I’d say this palette is very well worth it! Especially if you (or whoever you might gift this to) is more into glitter than I am. With that said, the regular retail price ($40) seems kind of high for a palette with 4 shadows and a blush — especially when the pigmentation isn’t totally out-of-this-world. So, make sure that if you want to buy this palette, buy it NOW while it is on sale! I have no idea how long the introductory sale will last…but don’t miss it! And don’t forget — use the coupon code SGHOLIDAY when you checkout to get 10% off your online order! READERS: What do you think? Is this something you’d give as a gift? Or get for yourself to use this holiday season? 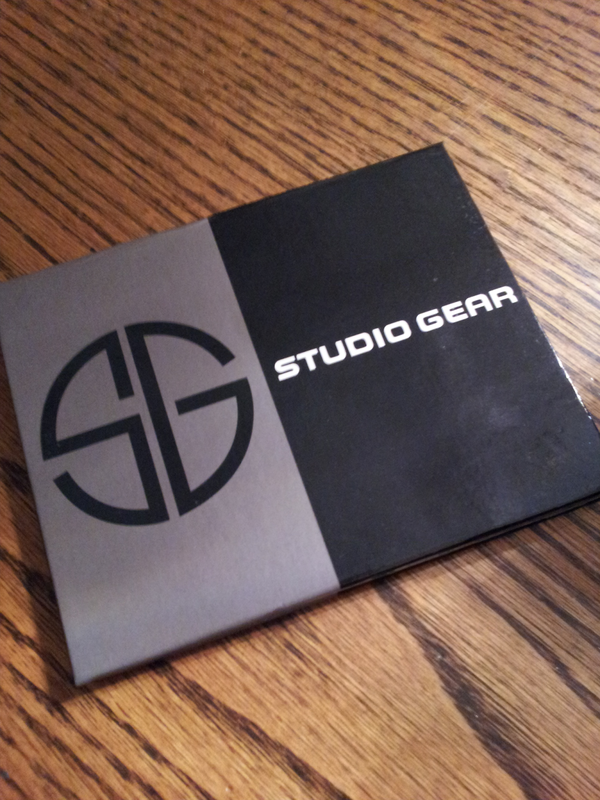 I received these product from StudioGear for free in order to review. It was not required that I give a positive review, but solely to express my own thoughts and opinions of this product, which I have done. I only recommend products and/or services that I have personally used or experienced and that I believe will be good for my readers. This post is sponsored by BrandBacker. I got this eye shadow palette too. I love the blush, I have been using it everyday. 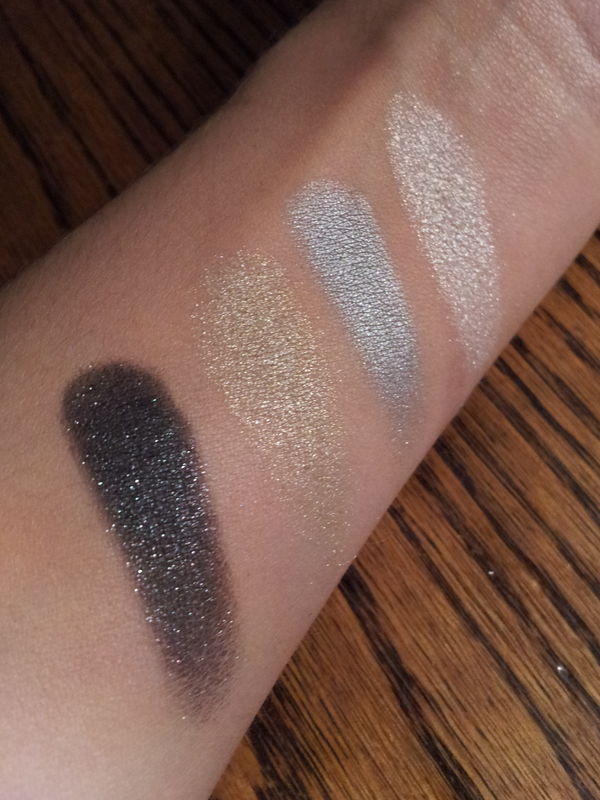 Your swatches of the eye shadows look amazing with primer. I'm going to have to try using them with primer now. Oh, the smokey eye palette sure looks glamorous. I have to consider this for my Christmas Party. Thanks for sharing. I like the colors in this palette. I would like to get this set for myself, and possible one for a gift. Thank you for your thorough review. I agree that sometimes the glitter shadows from some companies go a little overboard and are way too messy and chunky. Some of them make you feel like your eyelids are weighted down. Amanda – I'm so glad you found it helpful! Yes, I agree. Personally, I tend to stay away from glitter because I don't prefer it for myself. But I loved using the silver and black colors in this palette to make an evening look. It was very pretty! I am a bit finicky when it comes to glittery / shimmering eye shadows also. I mean they're perfect for special occasions but they usually end up dull by the end of the night. I do however like the platinum shade. I love those colors! What a great product to review. How have you enjoyed using the different colors? This is so pretty, and I love the soft simmer to it! I always love simmer eyeshadow especially around this time of year! Elizabeth – Well, I am just now getting into the holiday party/special occasion season, so I've just now went into "sparkle mode"! 😉 But just the other day I used the silver and black shades to make a beautiful, sparkly smokey eye that lasted all night. Loved it! I love the colors and styles of the eye shadow. It especially sparkles with the primer.